Travis style, named after the inimitable Merle Travis who popularized it, is a widely used term that encompasses a variety of fingerpicking styles. It’s characterized by a syncopated melody over a driving rhythm, often on two bass strings playing the root and 5th. It’s also been called Cotten Picking, after guitarist Elizabeth Cotten. Alternating bass is an extension of the Travis style. It adds another note, often the 3rd, making it sound much more sophisticated. -Read the tab, and listen to the audio example. -If you’re having trouble, begin by playing only the bass notes and add the top strings when you can keep a solid rhythm. -Nobody likes a metronome, especially me, but when starting out using one will help you’re timing immensely. Remember to start very slowly and make sure every note is sounding out clearly, tap your foot and get used to the rhythm. 80bpm might seem painfully slow to you, but if you can’t play it slowly you’ll never play it properly fast. These basics movements are very important, so take the time to get the master these simple lessons before moving on. -Once you can play them, try increasing the speed of the metronome gradually, 5-10 bpm at a time. Don’t increase it again until you can play it flawlessly. -The top strings are labeled with the recommended picking fingers. It’s important to note that all of these exercises can be performed with alternate fingers. There are no hard fast rules for these; the fingerings listed are to get your right hand ready for what’s to come. Try switching it up when you have them under your belt. -These first exercises are all played holding down an E major Chord. The right hand is what we’re focused on here, so if you want to sit in front of the television or read a book while working on your muscle memory try tuning the guitar to a chord like open G (DADGBD) and play all the strings open. The next two examples make use of a dotted note, listen to the example for timing, and don’t forget to swing it! These next two are a real workout. Remember to start slowly and make the notes ring out clean. This final one is the same as the above, but played over a C chord. Try using the patterns from both 4a and 4b. been plaing for 3 years, started with LZ – Babe I’m gonna leave you. Hey! Nice lesson! Took me a while to get comfortable with the picking but now it’s fine. Changing chords while keeping up the pattern is still a bit challenging. One question regarding the C chord in general: is it better to get used to switching between the strings with the ring finger or can you also use the pinky so that one doesn’t have to move the left hand? Of course, there are no rules, but any recommendation from your side? Hi Nikibaldi, glad you enjoyed the lesson. I’m not sure if I understand your question, but for playing the bass notes C & G on the fifth and sixth strings it’s probably wiser to stick to using your ring finger. You could always use your thumb to hold down notes on the sixth string, which is how I tend to do it when possible. There are no rules, but try and consider the positions that require the least amount of movement. I’ve been playing basic fingerpicking patterns for a while and am just starting to get interested in country picking and country blues. I love that Travis / Chet / Lenny sound with the 4, 5, and 6 strings damped, but man is it uncomfortable for my wrist. Of course, I’m just starting to try it out. Is this something that really requires a thumbpick, or can it be done without? Also, is it more comfortable for the hands with a thumbpick? Are you using one in the recordings? Thanks!!! Love your site. It’s an amazing resource. Just to be clear, at the moment I’m trying to learn it without a thumbpick and have never tried using one before. Thanks! It shouldn’t be uncomfortable on your wrist and it should move very little when you play. If it hurts you could do some damage to yourself. 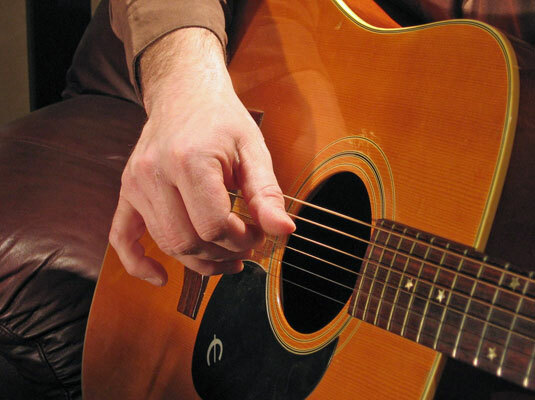 Make sure your wrist is relatively straight and your arm is relaxed, almost as if you were going to strum with a pick. To get the damping move your whole hand until the heel rests on the bottom strings, don’t bend at the wrist. You don’t need a thumbpick to do any of this, in fact you’ll probably find it easier without one in the beginning. I’m using one on the recording, you’ll find the bass is a little more crisp and you get more volume, but it’s by no means a requirement. Just on the note of a thumbpick, could you also use your thumbnail or would it be better to have a thumbpick? Whatever works for you, thumbpick nail or the meat of your thumb. You’ll get more volume and definition immediately with a thumbpick but it’s definitely your choice. in the last excercise what do u mean by putting that T mark? is it alternating the left ring ring finger between the 5th string and 6th string? You got it, I guess the T is a little confusing since it normally means thumb. This is a great website for anyone wanting to learn! I have searched for hours and finally found you! I have been playing the guitar over 40 years, mostly strumming and some picking w/pick. I have always wanted to learn to fingerpick but never found anything that started with the basics and here you are. Thank you, I’ve started at Lesson 7 and look forward to getting my thumb and fingers in shape. Thanks Woody, best of luck! lesson 7……..How do I save the the sound clips from the lessons so i can play it back at a slower tempo? hey man, this is a great site! your explanations are clear and relevant. i’m just getting into fingerstyle blues and this is just the jam i need. looking forward to your next lesson. thanks for all the hard work.